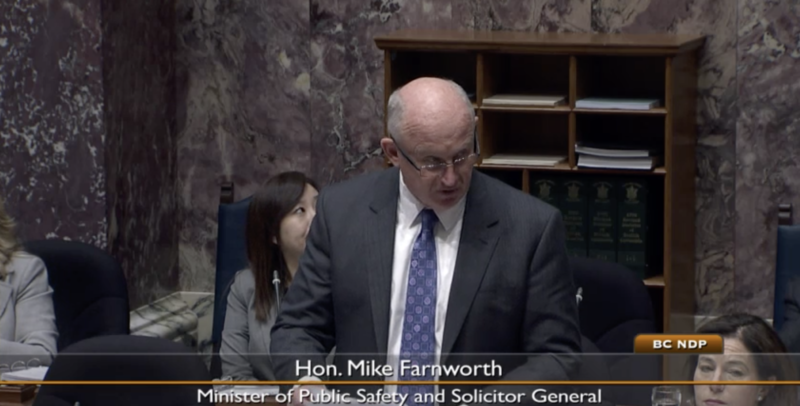 Excerpt from debate during Question Period in the Legislature on Monday, Oct. 15, 2018 between Solicitor General Mike Farnworth and Kamloops-North Thompson MLA Peter Milobar. Hon. M. Farnworth: Not only have we consulted with British Columbians on cannabis policy in general, put together a working group with UBCM, consulted with First Nations, consulted with dozens of industry and trade and professional associations around this province dealing with the myriad issues that come about because of legalization, we met…. Hon. M. Farnworth: Yeah, it’s called governing. It’s something that you’re not doing. For example, local communities had significant questions around issues such as the ability to control the number of plants being grown in a private residence. They do now. Communities had real concerns. Stratas had real concerns. Businesses such as landlord associations had real concerns about the ability to regulate the smoking of cannabis and the use of cannabis products in private rental dwellings. All of those kinds of policy initiatives have been undertaken in the last year. We have addressed all of them, and nearly all of them to the satisfaction of the people being impacted by the legalization of cannabis. We are not going to apologize for doing this right. I have been really clear that it is going to take time to establish a legal retail market in this province. It starts on October 17. It is going to ramp up in the coming months. It is going to be one that we can be proud of because it will allow regular British Columbians, not just the big chains, to participate in what will be an exciting new opportunity in this province. To the minister. This statement was two weeks ago by a senior civil servant. Is it accurate? Is it true that this government doesn’t have it right when it comes to the cannabis file? Hon. M. Farnworth: Kamloops certainly seems to think we’ve done it right when they’ve got the first government store in the province. The Landlords Association seemed to think we’ve got it done right when we said that landlords in this province will have the right to say who does and does not smoke cannabis and use cannabis in one of their rental units to protect their investment. The medical community said we got it right, right at the very beginning, when we said that we will not sell cannabis and alcohol in the same outlet, something that you guys said needed to happen. I think we got that right. I think we got it right when this side of House was the only jurisdiction in this country that led the fight to get clarity at the border, in terms of people who will be working in a legitimate and legal business in this country. I can tell you that in the last few months, once that issue came to the fore, there were many entrepreneurs who were saying: “Hang on a second. We were looking at investing in cannabis retail in this province. We’ve pulled back because of the uncertainty at the border.” It was this province that got that clarified. It’s this province that’s been doing it right. And it’s this province that will continue to do it right. Mr. Speaker: The member for Kamloops–North Thompson on a second supplemental. P. Milobar: It’s no surprise that outside agencies would be singing the praises. They probably got the memo of what happens to you if you dissent with the government. Again, from two weeks ago. So if civil servants working on this file don’t have the confidence in this government’s approach, how does the minister expect British Columbians to have any confidence? Hon. M. Farnworth: Well I just laid out a whole series of ways in which we’ve got it right. I’ll lay out a few more for the member. The legalization of cannabis also represents a significant economic opportunity for many regions of this province. Kamloops, with a store, clearly recognized that. But many other communities and regions in this province recognize that. That’s why they were very concerned when the federal government brought out its initial regulations where the only licensed production that was really being considered was large-scale production, which would severely disadvantage regions in this province where there is a lot of expertise that has the opportunity to become legal. Well, because of the efforts of this province and my ministry, we got the federal government to change those regulations so that small-scale, micro producers — and I know that the Agriculture critic would be really happy to know — were included in those changes so that it will create significant economic opportunities, not just in the Kootenays and on the Island but for First Nations as well. We got that right. One final thing, I’d like to remind the member from Kamloops that his predecessor, the former Health Minister, Terry Lake, was on Global the other night saying we got it right. I’ll tell you what, I’ll take his opinion over yours any day.